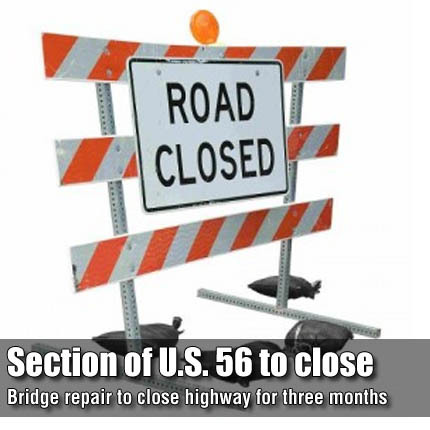 Weather permitting, at 9 a.m. March 14 a bridge replacement project will begin on U.S. Highway 56 just west of the U.S. Highway 75 junction, in Osage County. Crews will replace the box culvert located under U.S. 56 roadway at Hundred Ten Mile Creek. Both eastbound and westbound U.S. 56 will be closed to all but local traffic approximately .44 miles west of the U.S. 56 and U.S. 75 junction. A marked detour will be provided. Traffic will follow a marked detour on U.S. 56 through Burlingame to Osage City and then back to U.S. 75 via state Highway 31. Drivers must use alternate routes during the project duration. Bryan-Ohlmeier Construction Company is the primary contractor on this $214,227 bridge replacement project. The scheduled completion date for the project is mid-June 2011. For more information on the project, contact Kimberly Qualls, public affairs manager, at (785) 640-9340, or Steve Baalman, field engineering administrator, at (785) 296-2291.